If you like sandy beaches, luxurious guest rooms and stunning ocean views, you will love the luxury St Regis Mauritius Resort set on the beautiful bay on the southwestern side of the island. 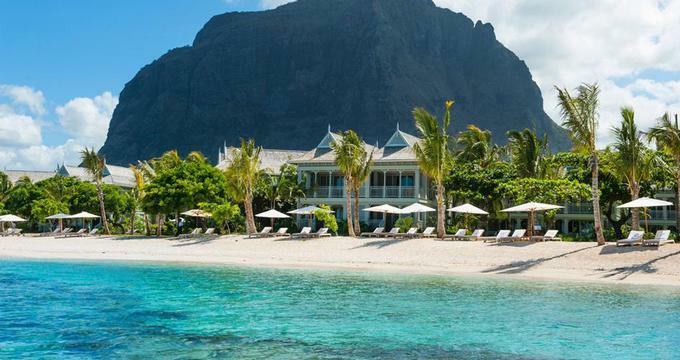 Since Le Morne is a UNESCO World Heritage Site, the beach and the turquoise lagoon surrounding the new resort are pristine. The hotel pools, lounges and the spa invite each guest to relax and rejuvenate in an incredible setting. Click here for great packages. The property has 172 rooms and luxury suites which come with the exclusive St. Regis Butler service for the duration of your stay. Whether you need something special from the hotel kitchen, want rose petals in your guestroom at night or need a last minute shoe shine service, the butler is there to help. Guest rooms have 42-inch LCD televisions, iPod Docking Stations, signature St Regis beds and a spacious bathroom with a designer oval-shaped bathtub, perfect for soaking away the stress on this incredible getaway. The most luxurious option is the beachfront St. Regis Villa with its own private entrance, four luxurious bedrooms with private pools and a spa treatment room. If you are a spa fan, the private treatment room in the villa is a great way to get the best spa service in complete privacy. There is a wide variety of activities to choose from right on the property, and many more nearby. You can take the limousine service to any attraction. There is kayaking, fishing, horseback riding, snorkeling, planned Poolside Activities, aerobic classes, personal trainer, snorkeling and nearby golf. Head to Iridium Spa for one of the signature treatment packages to experience rejuvenation and relaxation. Several dining options are available on property, including The Boathouse Grill & Bar , the Floating Market serving Pan-Asian cuisine, Atsuko serving Japanese dishes, Simply India which offers Indian food, Inspiration for French food and Le Manoir offering Contemporary cuisine. The 1904 Bar serves cocktails and snacks, including the Bloody Mary, the St. Regis Signature Cocktail. Room rates start at 670 Euro per night. You can use your well earned Starpoints to book (from 20,000 per night).